There’s a dangerous mental laziness inherent in the use of clichés that, if unchecked, can lead us, and our readers, to a limited worldview—particularly when those clichés are stereotypes. In this week’s guest blog, author Sharon Woods Hopkins shares anecdotal examples from her own endeavors to eschew stereotypes in favor of increased imagination and creativity. I was told a long time ago that clichés are weak writing. So are stereotypes, which are a form of clichés, about groups of people. If you write about bikers, don’t make them leather jacket thugs. For example, I know a great group of Christian bikers, and let’s not forget the Freedom Guard riders. Even if your biker, protagonist or antagonist, isn’t the church-going type, write him or her with an unexpected characteristic. Maybe he or she is a dog lover and carries a miniature poodle in a backpack. If you write about a group of people, make them unique, different, and most of all, interesting. I had stereotypes to avoid in Killerground, my fourth Rhetta McCarter mystery. Like the first three, this story is set in rural Southeast Missouri. That, in itself, could give rise to the Ozark hillbilly stereotype. Instead, my protagonist is a businesswoman who drives a resto-mod 1979 Camaro with a Corvette engine. At the heart of the trouble are unusual deaths of members of a Native American tribe whose land borders that of a mysterious group that call their compound the Righteous Rewards Retreat. The challenge to the stereotype of a cult compound here was to make the Righteous Reward compound something other than a religious group. It would have been easy to make them ultra-conservative and right wing, and that scenario has been done a lot. The leader, or Teacher as he’s called, is a billionaire from Oklahoma who believes in lay lines and the mystical powers they hold. There is no worshipping involved. The conflict between his followers and the neighboring Native American tribe is over a natural spring that sits directly on a lay line that Teacher feels has magical power, but which belongs to the Native American tribe. I enjoyed creating the character of Chief Ed Silver Fox, who strongly resembles a dear friend, Chief Paul White Eagle, whose help was invaluable in this story. At the same time, it was a challenge not to stereotype the chief, too. In many stories, Native Americans live on reservations, are poor, and suffer many addictions. The Native Americans in this story are not a recognized tribe by the US Government, and live on land they own independently. The chief is a talented, widowed artist determined to build a historical museum to tell the story of his dwindling tribe. He is calm, charismatic, and very wise. He is, however, distrustful of most non-Native people. Another issue particular to the writing of this book was changing the occupation of the character and building a new world for her that was different from the one she had had for three books. I had to create a whole new occupation for Rhetta, while maintaining her circle of supporting characters. They needed different jobs, so it was a challenge to figure out what they would all do, and how they would mesh and be relevant in the new story. I did that by having my protagonist form a charitable foundation and hire her friends to work for her. Her first project was to help the Chief build the museum. That put her in a position to be involved with the Chief, and by extension, the Righteous Rewards Retreat, and the mysterious deaths, one of which she witnessed. As always, I strive to make Rhetta, who is just a normal woman thrown into extraordinary circumstances, smart, funny, and too nosy for her own good. Keep clichés for conversation, like the next time your neighbor is as drunk as a skunk. Sharon Woods Hopkins, author of the award-winning Rhetta McCarter mysteries, is retired from banking and spends her time writing and volunteering. She owns the original Cami, a restored ’79 Camaro who appears as a character in her books. Her hobbies include restoring muscle cars and painting. Her first book, Killerwatt, placed as a finalist in the 2012 Indie Excellence Awards. Her second, Killerfind, won first place in the 2013 Missouri Writers’ Guild Show-me Best Book Awards and placed as a finalist in the 2013 Indie Excellence Awards. The third in the series, Killertrust, was a finalist in the 2014 Indie Excellence Awards. 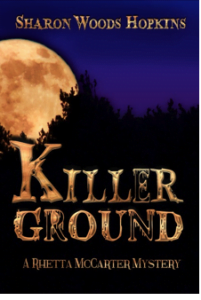 Her newest in the series, Killerground, was released in 2015. Her award-winning short story, “Rear View Mirror”, was published in That Mysterious Woman anthology in 2014. 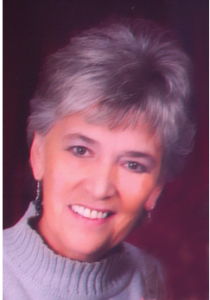 She is a member of Sisters in Crime, Guppies, International Thriller Writers, Missouri Writers Guild, Southeast Missouri Writers Guild, and Heartland Writers. You can find Sharon at the website she shares with her husband and fellow author, Bill Hopkins, the other half of The Deadly Duo, at www.deadlyduo.net, on Twitter @sharonwhopkins, and on Facebook at www.facebook.com/sharonwoodshopkins.